Aimee Leduc is happy her long-time business partner Rene has found a girlfriend. Really, she is. It's not her fault if she can t suppress her doubts about the relationship; Rene is moving way too fast, and Aimee's instincts tell her Meizi, this supposed love of Rene's life, isn t trustworthy. And her misgivings may not be far off the mark: Meizi disappears during a Chinatown dinner to take a phone call and never comes back to the restaurant. Minutes later, the body of a young man, a science prodigy and volunteer at the nearby Musee, is found shrink-wrapped in an alleyway with Meizi's photo in his wallet. Aimee does not like this scenario one bit, but she can t figure out how the murder is connected to Meizi's disappearance. The dead genius was sitting on a discovery that has France's secret service keeping tabs on him. Now they re keeping tabs on Aimee. A missing young woman, an illegal immigrant raid in progress, botched affairs of the heart, dirty policemen, the French secret service, cutting-edge science secrets and a murderer on the loose what has she gotten herself into? And can she get herself and her friends back out of it all alive? Cara Black is the author of eleven previous books in the "New York Times "bestselling Aimee Leduc series, all of which are available from Soho Crime. She lives in San Francisco with her husband and son and visits Paris frequently." "Outstanding.... Readers will relish realistic villains and an evocative atmosphere that begs for a trip to the City of Lights." "Black expertly weaves the social issues of Chinese sweatshops and illegal immigrants with current science and computer technology, 14th-century Templars and guilds, and the local police and French secret service." "[O]ne of the most atmospheric crime novels I've read in a long time." Black has painted such a rich sense of place, and crafted much in the way of gripping diversions and accelerating drive to rivet the reader to the pages." "Paris never needs a new look, and neither does Aimée Leduc." "Perfectly plotted.... Filled with evocative details and quirky characters as delightful as the smell of a fresh-baked baguette." "The pace accelerates as fast as Aimee's Vespa.... 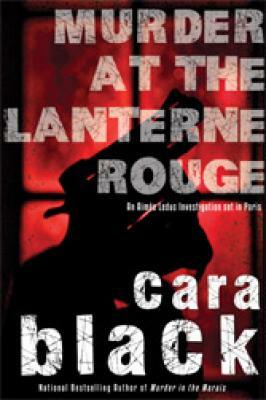 Murder at the Lanterne Rouge is wonderfully plotted, and Cara Black ties together the past and present with élan." "[Black] lets readers peek into a corner of Paris that Fodor's leaves out." “Smoothly written and tightly plotted."